Before we left for the babymoon, I went had my 1 hour glucose test. Since I live within walking distance of my OB's office and lab, she allowed me to take the glucose drink home and then come in to have my blood drawn an hour later. So at 8am I took the drink out of the fridge and drank it in minutes. It tasted like over-sugared orange Kool-Aid. 45 minutes later, DH and I drove to the lab and waited until the hour mark and I had my blood drawn, with a baby's needle because that's how I roll. After my blood draw, I went to my monthly OB appointment and while the Doctor was performing the ultrasound, I started getting dizzy. My skin broke out into a cold sweat and I almost blacked out. 10 minutes later I had recovered but for the rest of the day, I was tired and weak. What a great way to start the babymoon! As I was headed into get my Mommy To Be massage, I received a message from my OB's office asking for a call back. They knew I was babymooning and just asked that I call back on Monday. Of course, I was sure I had failed the 1 hour glucose test. This was confirmed this morning when I checked my test results on my medical records website. My results were 191 while the normal range is 70-130. That's a huge failure. And while I'm wallowing in this pity party, feeling like I've failed my Little One before he's even arrived, I've decided to educate myself and come up with an action plan. What happens after failing the 1 hour glucose test? In my case, I'll need to go to take the 3 hour test at the lab. They'll draw my blood for a starting point, I'll drink and even more heavily sugared glucose drink and have my blood drawn every hour for 3 hours. Based on those results, they'll diagnose whether or not I have Gestational Diabetes. In some cases, however, if the results to the 1 hour are high enough, depending on the medical group's policy, they may just immediately move to prescribing a diet, monitoring regiment or medication to control the diabetes. Gestational Diabetes occurs in 18% of pregnancies. The placenta produces hormones that inhibit the production or effectiveness of the mother's insulin resulting in high blood sugar that is absorbed by the baby. This doesn't really effect the baby until the last trimester when the baby is fully formed. The excess sugars end up being being stored by the baby as fat. -Large babies can need to be induced early and/or require birth by c-section. -In the cases of natural birth, large babies can have shoulder damage because they are too large for the birth canal. -Newborns of mothers with Gestational Diabetes can have low blood sugar as their pancreas produces insulin to deal with the excess sugars. They may also have breathing problems. -Babies with excess insulin may become obese adults or develop Type 2 Diabetes. Family or personal health history. 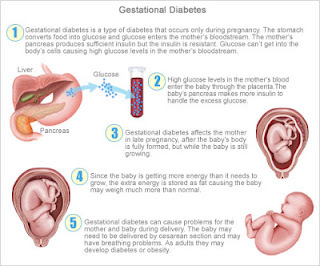 Your risk of developing gestational diabetes increases if you have prediabetes — slightly elevated blood sugar that may be a precursor to type 2 diabetes — or if a close family member, such as a parent or sibling, has type 2 diabetes. You're also more likely to develop gestational diabetes if you had it during a previous pregnancy, if you delivered a baby who weighed more than 9 pounds (4.1 kilograms), or if you had an unexplained stillbirth. Nonwhite race. For reasons that aren't clear, women who are black, Hispanic, American Indian or Asian are more likely to develop gestational diabetes. In most cases, a change in diet and increase in exercise is enough to control blood sugar levels so that it doesn't become a problem. In more severe cases, oral medications and even injections may be necessary to address the problem. This week, I'll be switching over to a Gestational Diabetes meal plan and increasing my daily exercise from a few times a week to 30-40 minutes daily. More more meal plans you can visit Love to Know Diets and Gestational Diabetes at About.com. Update: I passed my 3 hour glucose test with no signs of Gestational Diabetes! Hurrah!